In a blog post in February I wrote about the fire at the warehouse where our boxes were stored for many years before this project began. For the past 3 1/2 years our workflow has been to bring 100-200 boxes into our offices at a time where we do what we do with files (officially called “processing”). As I mentioned in the February post, we had 305 boxes remaining in storage before the fire. We requested delivery of the remaining boxes in two shipments; the final count of boxes lost in the fire was 123. For the most part the lost boxes were scattered among the different departments represented in those 305 boxes, but a high percentage were from Overseas Services, Immigrant Services, Administration and Government Relations. Except where there were fewer than 5 boxes from a department, at least some of the material in each department survived; we will in the end have a slightly smaller snapshot of the work of these departments. The largest portion of these records is from the second half of the 1990s. To look at the loss of these boxes philosophically, records from many non-profit organizations that are ultimately transferred to the archives for permanent retention seem to have survived almost at random. UJA-Federation of New York was more organized than many non-profits, having engaged the services of a consulting archivist for many years – Colonel Seymour Pomrenze, who we have written about in this blog before. The colonel determined the fate of many of UJA-Federation’s older files in an organized, professional manner. Because of his professionalism many of the hundreds of boxes of files that were not of permanent value were destroyed long ago, saving UJA-Federation thousands of dollars in storage fees. The material that remained and which became the core of this archives project, is in the process of becoming the permanent record of the legacy of UJA- Federation of New York and its predecessor organizations. What files ultimately remain is what historians have to sift through to tell the story of an organization – a movement, a certain time in a community when a group of men and women took care of those less fortunate than themselves. The surviving files, whether through careful determination according to a retention schedule or to random placement in a warehouse, become what we ultimately learn and remember about the past. 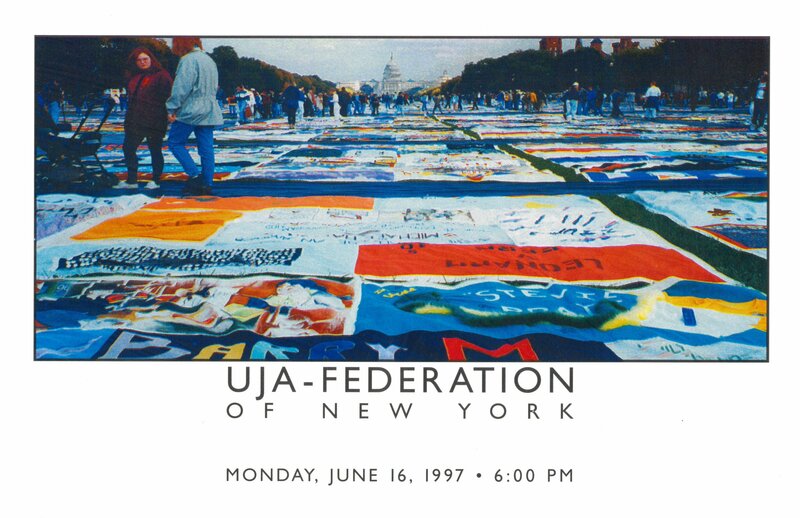 In the late 1980s, UJA-Federation began providing assistance to HIV+ people and people with AIDS. This assistance took the form of programs, educational conferences, counseling, and housing assistance, mostly provided through Federation agencies, which were funded largely through grants. This Domestic Affairs Division program fell under the heading of “Special Projects” and Simha Rosenberg served as UJA-Federation AIDS Project Coordinator from about 1988 until about 1994. 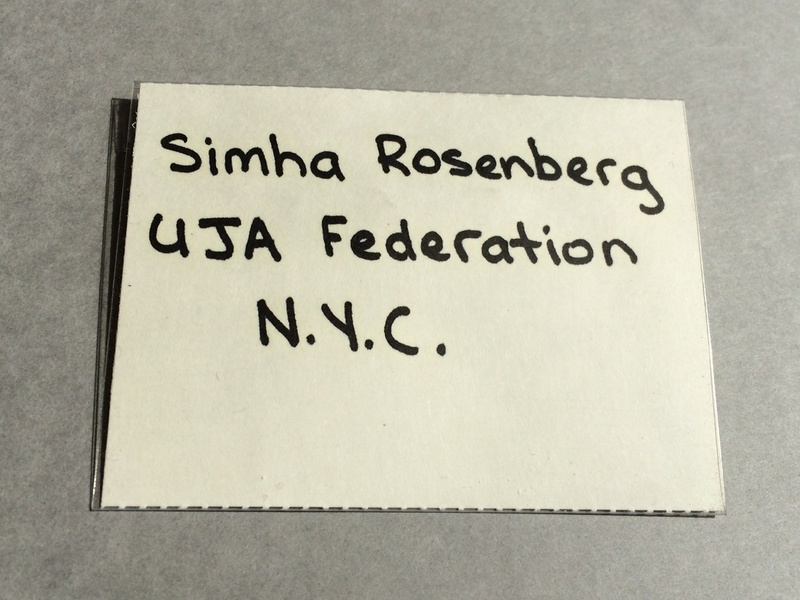 Name tag from one of the many AIDS-related conferences attended by UJF Special AIDS Coordinator Simha Rosenberg. 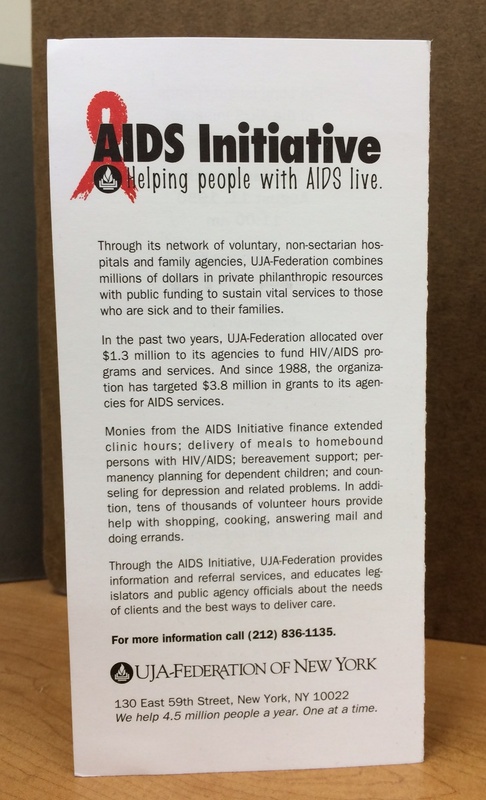 UJA-Federation’s willingness to take on the crisis of AIDS, particularly as early as the 1980s, investing over a million per year, as well as time and expertise, speaks volumes about the humanitarian orientation of the agency. It also indicates UJA-Federation’s willingness to adapt to the times, their foresight, and their exceptionally inclusive view of community. 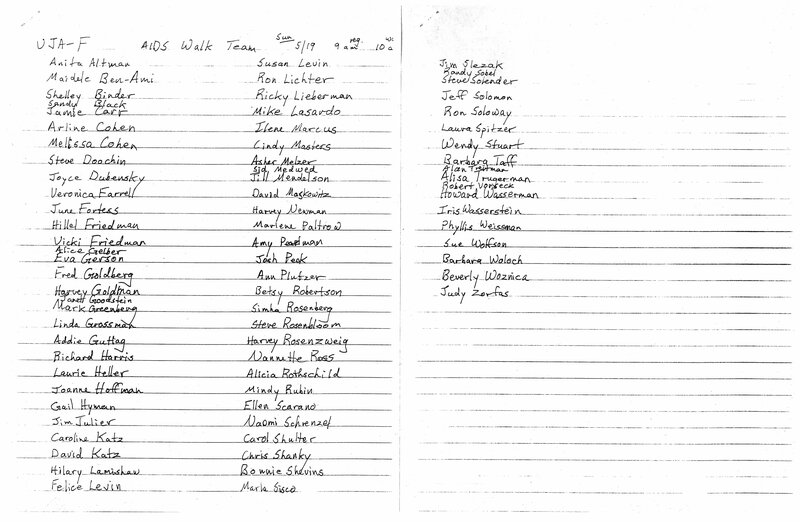 It is clear from the document below showing that 76 people on UJA-Federation’s staff participated in the 1991 AIDS Walk that many at UJF had a personal stake in the issue. Rosenberg attended a great many AIDS conferences on behalf of UJA-Federation and led quite a few, as well. Both types of conference materials are included in the Special AIDS Project subseries. She also served as UJA-Federation’s representative at the New York AIDS Coalition (NYAC), and many folders in the subseries document her committee work there. The collection documents some of NYAC’s political activism in the form of postcards demanding more funding aimed at Governors Mario Cuomo and George Pataki. Rosenberg was instrumental in obtaining grants for Federation agencies to carry out AIDS progams and these efforts are documented here. 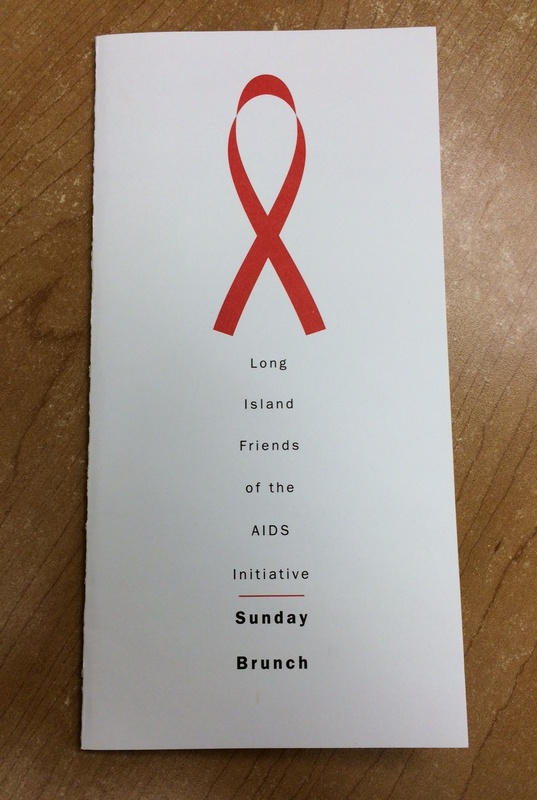 Researchers can also learn about AIDS fundraising events held by UJA-Federation. One such event represented in the files was the “Madison Avenue Sell Out,” which involved many of New York’s most successful advertising agencies and corporate sponsorship. The project also planned and implemented workshops designed to inform agency staff and program participants about the disease, from which extensive data was collected. The raw data, taken from pre- and post-workshop surveys, delineates attitudes and knowledge of the disease and sexuality at that time. It can be found in folders titled “AIDS Education and Training (AET) – Evaluations” within the subseries. Rosenberg apparently published some scholarly articles as a result of her initial AET Evaluation findings. Future researchers may wish to delve deeper into this data. 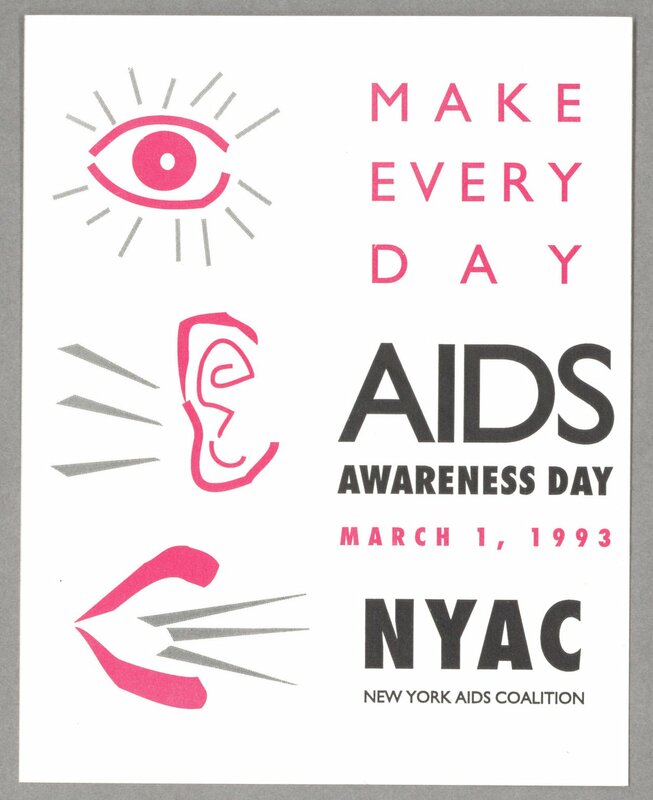 Other areas of interest within the subseries include files on Gay Men’s Health Crisis (GMHC), medical research, press coverage of the disease, and Rosenberg’s own chronological files. The collection is comprised of nine cartons on the Special AIDS Project, spanning the years just prior to and just following Rosenberg’s tenure. While processing administrative and subject files of the UJA-Federation of New York’s Legal Department, I encountered several subject files labeled “Asset Study.” A few years after the merger between United Jewish Appeal of Greater New York and Federation of Jewish Philanthropies of New York, the Legal Department cooperated with other departments to create a comprehensive list and accompanying data related to the assets, including real estate, held by UJA-Federation and all of its predecessor organizations. 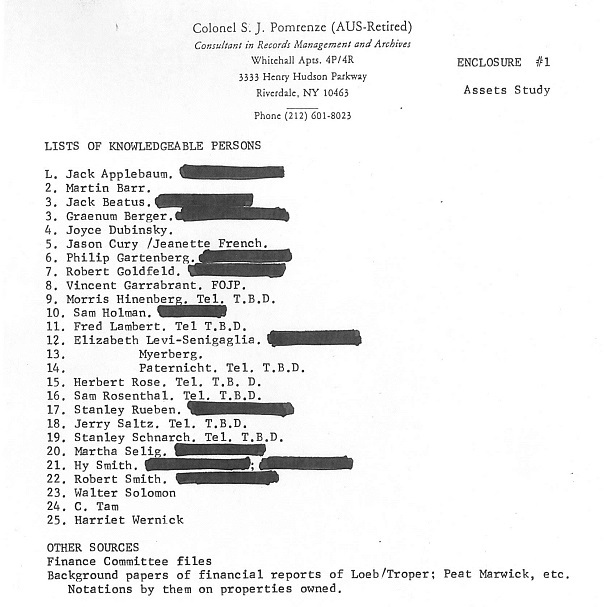 To that end, in April 1990, James L. Rothkopf contacted Colonel Seymour J. Pomrenze, the UJA-Federation’s record manager and archives consultant, to assist in finding documentation within the organization’s inactive records stored in their building and off-site storage. And, much like a reference request or inquiry sent to an archival repository, Pomrenze identified resources within the philanthropic organization’s inactive records to find information on real estate and tangible assets. As inactive records went into storage, either on or off-site, a List of File Folder Titles (LFFT), which listed the contents of each box, was placed in the box and also photocopied and retained by UJA-Federation. 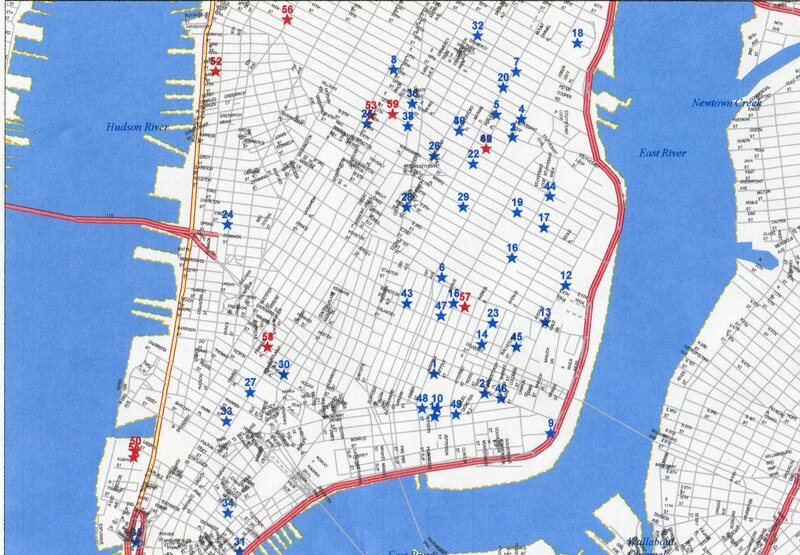 With the assistance of these LFFTs, Pomrenze and others could identify a list of knowledgeable persons, pinpoint the location of relevant records, create copies of lists of files and boxes with records “retired” (sent to storage) by knowledgeable persons, and help determine where information might be kept by the county or state governments related to property and land registries. With the names and LFFTs of knowledgeable persons, such as heads of departments, comptrollers, counsels, employees and consultants, the Legal Department could locate information by box and strategically recall boxes out of off-site storage to review and collate data on real estate and other assets held by UJA-Federation or its predecessor organizations and affiliated agencies. In addition to any of the assets identified within the early 1990s study, it is important to remember what an asset (or benefit) it is to have organizational records under intellectual control stored in a safe, ideally climate-controlled, environment for later inquiries from both the organization that created the records and researchers alike.